Tetlow King Planning (TKP) acting on behalf of Carillion-Igloo Regeneration Partnership and Coastline Housing achieved consent for a pioneering development on strategic brownfield land in the town of Pool, delivering innovative homes to a wide range of tenures, including Custom Build, affordable and over 50’s accommodation. The former mining and industrial land contains two neighbouring sites which will deliver 54 Custom Build, 70 affordable and 20 open market dwellings. 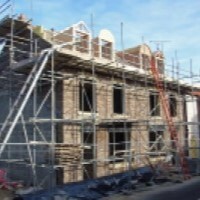 More recently the Government’s commitment to increasing delivery in this sector has been strengthened through policies to encourage such growth in both the National Planning Policy Framework and the Planning Practice Guidance. Custom Build offers more certainty that Self-Build as it delivers a plot that has outline consent and is serviced. The plot purchasers select from a pre-approved panel of manufacturers/builders to develop detailed drawings and obtain Reserved Matters consent. They work within a Design Code as a means of ensuring that their home complies with a set of parameters for volume, height and palette of materials. The 49% affordable housing was another key benefit of the scheme and includes flats designated to local people aged 50 and over. TKP were instrumental in achieving constructive engagement with the Council throughout the planning application process which assisted with the speedy approval.